Dina Kowal Creative: 9 years of blogging and a giveaway! 9 years of blogging and a giveaway! I started blogging 9 years ago today! So fun to poke back through the years and see growth and change - I'm grateful for those of you who have been faithful followers throughout the years - the counter in my sidebar is nearing a million views, and that's you all! Thank you for keeping me inspired and curious, and for welcoming me and my ideas into your lives and your inboxes. I think I've shared this card before, but I just love it - this is one of the cards that I made during my stint on the Splitcoast Dirty Dozen design team, and I still return to those cards as some of my favorites ever... there's something magic about them, even now. Well, you know if it's birthday time, there have to be presents - I have 2 prizes to share today, and another in my other post today for those who have an interest in Bible Journaling! There's a quick tutorial there too. Leave a comment before Friday (10/30) at midnight EST for a chance to win, and I'll announce my winners Saturday morning. Thank you again for visiting me!! Happy 9th Bloggerversary!!! Thank you for sharing your talent through the years (and for the prize chance!). Your print is gorgous and inspiring. Congratulations on blogging for 9 years! Your work is so inspiring. Congratulations on your 9th year blogging anniversary. Looking forward to receiving your newsletter for many more years to come. Dina, I always enjoy seeing your creations, they have such wonderful colors and textures, always pleasing to the eye. Happy Anniversary! Congratulations on your 9th anniversary. I've followed you for years and just love your work. Congratulations Dina on your Blogaversary! 9 Years Wow! I'm happy to be here and learn from a skilled artist! I really appreciate your tutorials on different proucts such as pencils, and markers, how they blend and what paper's best to use with them etc. Very informational blog and better yet, gorgeous projects! 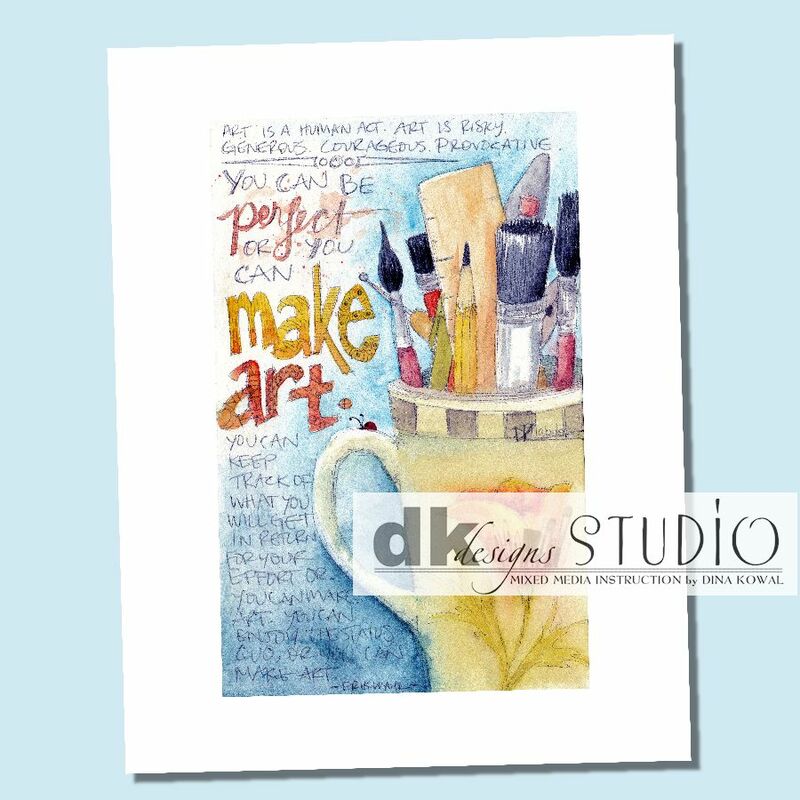 I hear my Make Art print has shipped and look forward to matting and framing it for my own Studio! Blessings! I would love to win! Love your work! Thanks Dina for all the great inspiration. May God continue to bless you and use each day. Well , I cannot believe I am first in line.....never happens so am very honored!!! I love your prints, made my husband order one can't wait for it to get here!!! Would love to be the owner of a box... What a cool idea. I would be happy with an empty box!!!!! Wait every day to read your blog... It just makes my heart smile!! Be happy!! What a wonderful accomplishment! I have enjoyed so many of your creative posts, because you have such a variety of techniques. Congrats on nine years of blogging! Love your work! big congrats mf. Your work is always amazing to me! What a sweet card. Please keep inspiring us. Wow, 9 years already?! That is a HUGE accomplishment in the blogging world. I used to blog, so I appreciate how much work goes into this. Congratulations, but most of all THANK YOU! I appreciate folks like you who take the time to share their talent and inspire and uplift the rest of us. You may be doing a giveaway, but honestly we are already all winners because we have the joy of learning from you, being inspired by you and enjoying your work! Thank you for sharing with us for these 9 years and hopefully many more. Congratulations on nine years of blogging and sharing your ideas with all of us.I look forward to at least another nine years! I'm so glad I found your blog a few years back! You are so inspiring and talented! Congratulations on 9 years. You are so talented! Thanks for all of the inspiration and for the great giveaway. Wow, 9 years, congratulations! Thanks for the chance to win! Congratulations on 9 years!! You are a super talented artist, which is why I love your blog! Dina, Your work is truly inspiring to those of us that aspire to even come close to your level of work. I enjoy your product comparisons as well as the tutorials you make for your fans. I can only imagine how much time that process takes. Please know that you are admired and respected for your talents and all you share. Thanks for sharing your creativity with us, Dina. Congratulations! Congratulations on 9 years blogging. Thanks for sharing your creativity and a chance to win! Happy Anniversary. You have been an inspiration and a joy to follow. Have a great celebration and may your side bar go to the hundred millions and more!!!!!! congrats on 9 years. I don't know how many years I have been following but quite a few. what I love most is you break down art into manageable pieces for those of us that don't have the knowledge that you have. I love when you show a technique or a new product or a new way to use an old one. there are so many mediums out there that I had never heard of and i'm glad you bring them to my computer. thanks! hope you have many more years of blogging. Happy blog birthday! I love to see the process of your creations and I love the videos. You definitely inspire me and so many more. As our AWANA kids say at the end of our birthday song...cha cha cha and I'll add what we used to sing at the end "and many more!" Happy 9 th Blog Birthday. Happy Birthday, Happy Anniversary, 9 years of blogging!!! Congrats and I wish you many more years. I have enjoyed your blog for several years and am inspired by all that I see. Thank you for sharing your experience, your talents, your time, and your love. We have all learned so much from watching your videos and reading your instructions and answers. I look forward to spending time with you in our Father's kingdom! God bless you, Dina! Happy blog birthday, Dina! You are an inspiration to me and I totally enjoy everything you make. Thanks for sharing your gifts with the world! Happy Anniversary. I ALWAYS look forward to seeing your next great creation!! Congrats on a big blogaversary! And thanks for the chance to win! WOW!!! Happy Blog Anniversary!!! Such a darling card and your coloring is so gorgeous!!! Thank YOU for all the creative inspiration you have shared on your blog. Love it when I see something from you in my in box. I hope you keep going, and going, and going like the energizer bunny. Congrats on 9 years of sharing your creativity with all of us! You are so talented and have inspired me to try things I would never have tried before. Thank You! congrats on your bloggerversery ( if that is a word, lol) love looking at your projects! Happy 9th Anniversary Dina!! I have been following you the last four of them! What a sweet card from your DD time! My stand out cards have all been ones that I have made for a special occasion at SCS, usually HYCCT! Your art piece is exquisite. I had fun watching your video on FB when you opened up the package. Almost like being there! :) Again, Happy Anniversary and I look forward to seeing what you create in the future! Congrats on 9 years! Thanks for sharing your creativity and techniques. Congrats on a successful 9 yrs!!! Love your blog. Thank u for sharing new ideas! Congrats on 9 years and here's to another 9 years! Love all you create & share! You're sooo very talented, Dina! Thank you for sharing these talents with us thru the years. Congrats on your blogaversary!! I love the card you showed us today - magnificent! I am in Canada so I am not qualified for your generous gift. Happy 9th. Always look forward to your blog. Your talent is amazing. Thanks for a chance to win. Love your prints. Happy, happy anniversary!!! I'm not sure how long I've been subscribing but it's been quite a few years now. I've not even been a card maker for 9 years yet, but it's getting close to that. How time flies! Here's hoping the next 9 will be as wonderful for you as these past 9 years have been!!! Thanks so much for all that you share!!! Happy 9 years!! I love this card! thanks for sharing and the chance to win! Dina, thank you for the inspiration and tutorials you have shared over the years. For those of us who are less than proficient artists, you inspire us to try new things. Happy Anniversary! Thank you for all your wonderful techniques, tips and shares over the years. Would love to be the lucky winner of either of your giveaways but the print would look super in my studio. Looking forward to what you have in store over the years. Hear's to 9 more. Happy Anniversary ! Many more years of inspiring art in us and for us. You are so inspiring! You make it okay to experiment, try different techniques and expand ones thoughts about what is art. You have a unique and special gift. Thank you for sharing it. Well...Happy Birthday to you .Congrats on the 9 years of .blogging. Lets go for at least 9 more. Love all your posts. What an inspiration! Happy Anniversary! Happy anniversary - it's been fun to be on this journey with you - you've inspired us all. Selamat Ulang Tahun Blog Ke-9! Happy 9th Blogaversary! You have inspired all of your readers, Dina. Thank you for sharing your love of art with us! Blessings for years to come! WOW Dina! Happy 9th Anniversary blogging! That is a long time and you have so many talents to share with us. Thank you so much for sharing them. May God keep blessing you with all the wonderful followers. Happy 9th Dina - That's a lot of blogging for sure!!!!!! Would absolutely love to win one of your posters!!!! Passed your blog on to my friend and she is doing the Bible Journaling with her art...sooo pretty and inspiring - thank you for that too! congrats to you mamadina!! 9 years is a while.. where did the time go??? I just watched your color pencil tutorial and came to your blog. I love it and am now following you! Happy 9th anniversary for your blog. I received the art print in the mail yesterday. It is awesome, but would love to win a second for my artist son. Box of goodies looks interesting as well. Thanks for this oppurtunity. I love following your blog. Congrats on 9 years, Dina! Your art is amazing. Thank You for sharing your talents with Me! Thanks, Paulette S.
Since Google cna't remove this Blogger profile with outdate info and closed email address for a blog that no longer exists because it was imported to WP in 2012! Wow, 9 years that is amazing, it is always fun and sometimes entertaining to see how our craft has evolved over teh years. Here's to 9 more, keep the inspiration coming and thanks for chance to win. WOW!!! CONGRATS!! ....As you have grown and and seen changes, I have also grown and dared to go out of my box and tried your techniques and I am having a fab time trying all that you share!! Thank you for blogging and sharing!! Happy 9 years of creating and giving us readers Ooos and Ahhhhhs in your creative world! I love to open up your email each day to see how far my jaw will drop that day. Happy stamping, drawing and coloring and making! 9 Years that is great! I enjoy visiting your blog all the time. thank you for sharing your talents. Nine years of sharing! That's amazing! Love all your work...you are an inspiration to many! Thank you for 9 years of sharing. I appreciate it. Congratulations on 9 years of blogging Dina!! And all the other good things that are happening for you Sister! Thank you for the chance to win some goodies from you. Congratulations Dina on nine years of blogging. I love coming here to see what you share. I love your style and all your helpful reviews and instructions. Happy blogging anniversary to you! I have really enjoyed your posts over the years, please keep up the excellent work! I love your little girl!! Wonderful coloring dear friend! Congrats, Dina! Wow, 9 years! You have given so much inspiration...thank you for sharing your talents! Nice giveaaway. Happy blog-versary. Would love to win .